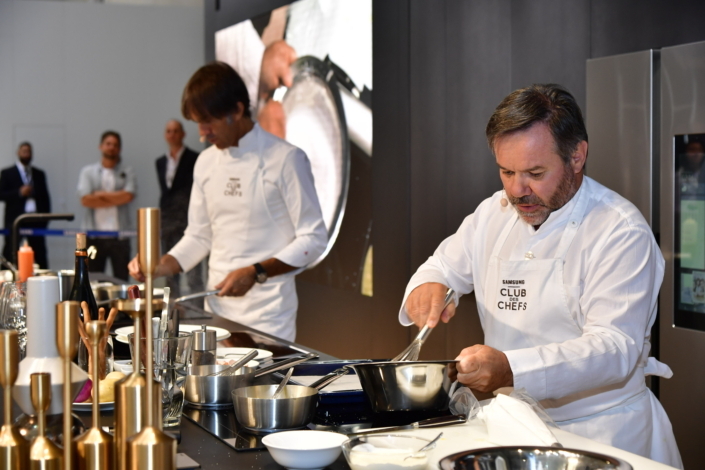 At IFA 2018 on August 31, Samsung teamed up with Michelin-starred chefs Michel Troisgros and Davide Oldani to host the Samsung Smart Life Recipe cooking show. 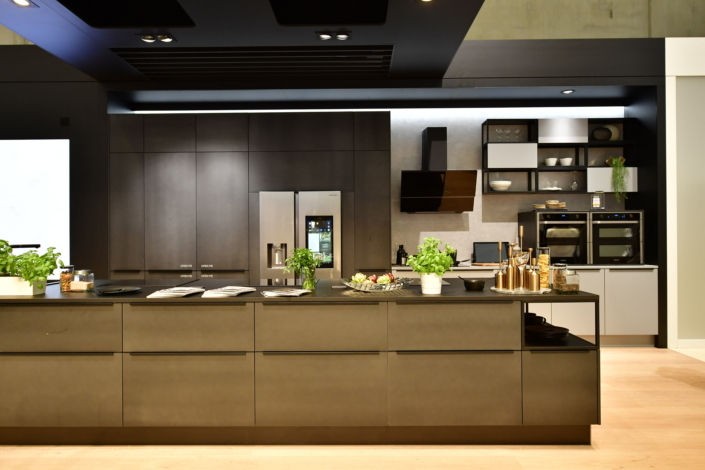 The event showcased the very latest of Samsung’s AI-enhanced kitchen appliances in a beautifully rendered, top-of-the-line modern kitchen, designed in collaboration with Nolte. 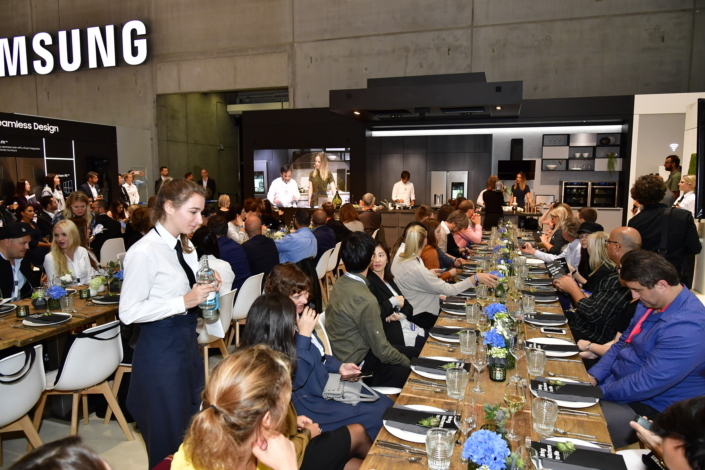 Over 70 IFA guests took part, eager to see the chefs concoct delicious meals prepared to perfection with the help of Samsung’s smart kitchen appliances. 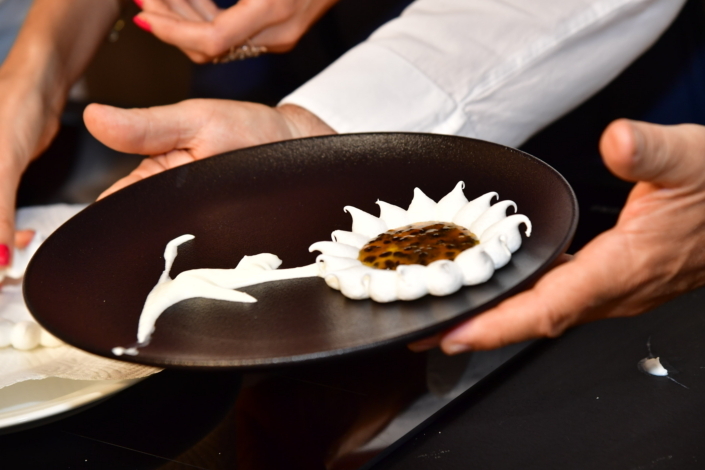 Chef Davide Oldani was in charge of the appetizer while Chef Michel Troisgros provided the main dish and dessert. In order to decide what to prepare, the chefs used the View Inside function on the Family Hub to look at ingredients without having to open the refrigerator. The chefs then reached out to the audience for a volunteer to take a look at the Smart Recipe offerings of the Family Hub with them. Smart Recipe is a novel intelligent function that recommends menu options for you based on the shelf life of the ingredients stored within, accommodating its suggestions to users’ tastes and preferences. Chef Troisgros (pictured above) praised its resourcefulness, noting that the strategic nature of the Smart Recipe function meant that no ingredient would be wasted. 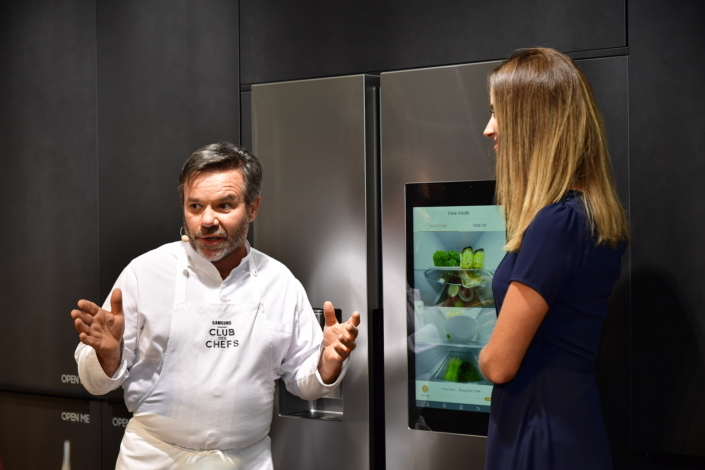 Chef Troisgros confessed to the audience that the Family Hub was his personal favorite feature for its aesthetic quality, intelligent suggestions and the usability of the screen – perfect for messy cooking sessions. When it was his turn to use the Family Hub, Chef Troisgros told the audience: “the ‘window’ function of the Family Hub is perfect for getting the most out of your food. Eliminating the need to open the fridge door frequently, ingredients inside are kept fresh and at their best for longer.” The View Inside function even lists the expiration dates of the products, ensuring your ingredients are prepared when at their best. Chef Oldani then utilized the Family Hub’s Smart Recipe function to settle on a unique bruschetta appetizer, regaling the audience with the fascinating story behind the evolution of the bruschetta recipe and even providing guests with a special Italian tomato water taster. 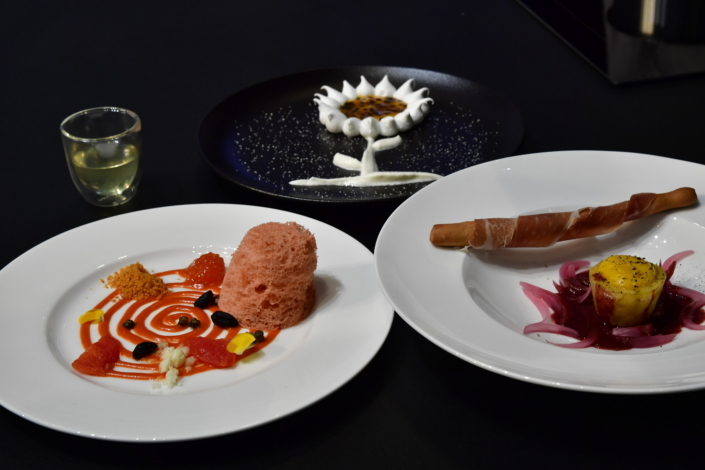 Chef Troisgros then decided on a dynamic recipe of his own for the main course, ‘Le Jaune Ivre de Rouge’; a baked potato with egg yolk and parma ham in a red wine sauce. 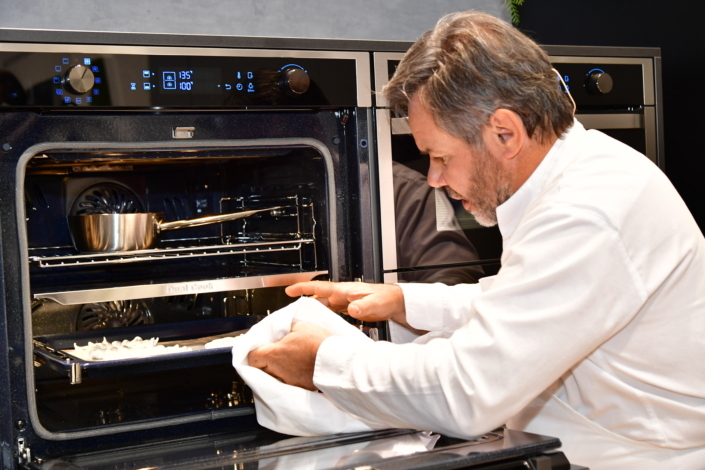 In addition to this helpful dual function, Chef Troisgros informed that audience that the Dual Cook Flex Oven automatically maintains the temperatures of both its compartments to ensure each dish is cooked to perfection, a feature critical to food preparation. 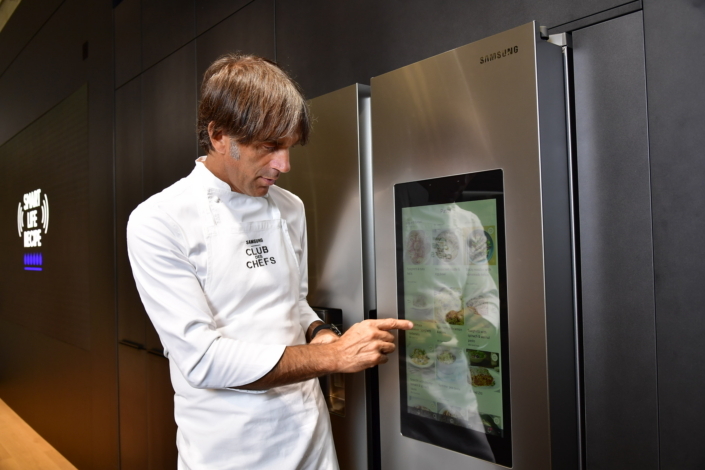 The built-in smart kitchen that was used during the cooking show is a collaboration between Samsung and German premium furniture company Nolte, with Samsung’s latest smart appliances fitting seamlessly into the luxurious design and décor of Nolte’s signature kitchen furnishings. The sleek design and sophisticated layout of the cooking space attracted many guests’ attention. This year’s Samsung’s built-in kitchen booth was also designed with other luxury furniture brands including Italy’s LUBE, which are shown in the ‘Premium Kitchen Zone’ alongside Nolte products, and at luxury built-in brand ‘Dacor Zone’, attendees are able to peruse some of these innovative designs. The IFA kitchen is a testament to how Samsung smart kitchen appliances with AI and IoT can harmonize seamlessly with kitchen furnishings. 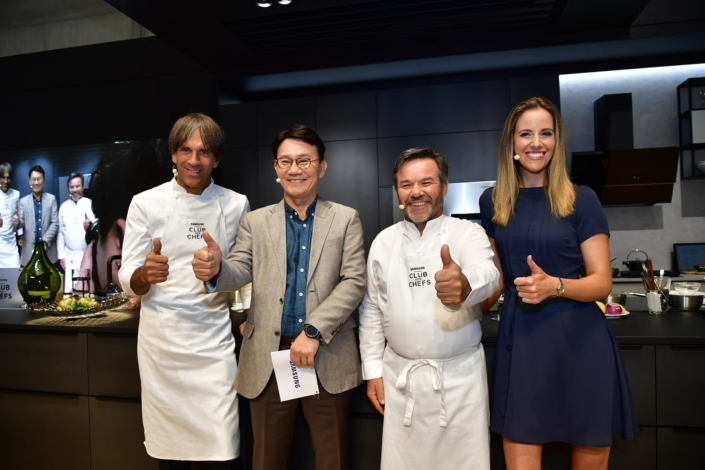 Samsung has also collaborated with renowned brands including Scavolini and Veneta Cucine, and participated at exhibitions like EuroCucina to strengthen its commitment to building world-class premium appliances. The smart kitchen zone was enhanced by luxury built-in kitchen appliance brand Dacor for a seamless finish incorporating the premium smart appliances into the kitchen space fluidly. 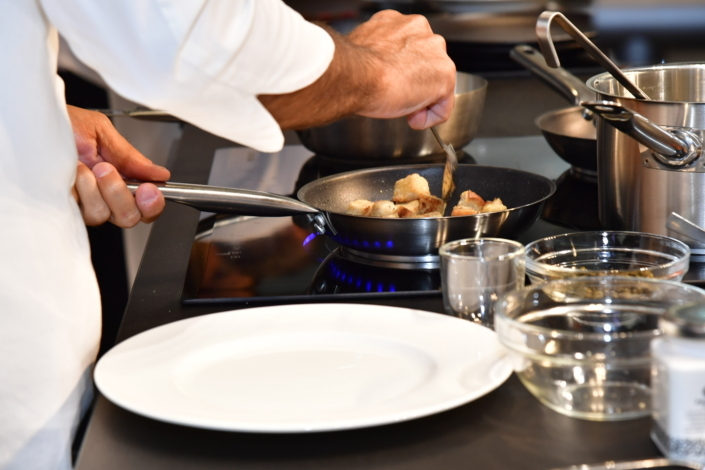 Having finished their meals, audience members expressed their wonder at the delicate tastes of each course, all cooked to perfection with Samsung’s intelligent kitchen appliances. Audience member Michael Wasiau especially appreciated the experimental nature of Chef Oldani’s bruschetta course, made with such simple ingredients as discovered in the Family Hub fridge. The audience left the cooking show inspired to make their own meals effortlessly with the help of the Samsung smart appliance ecosystem. 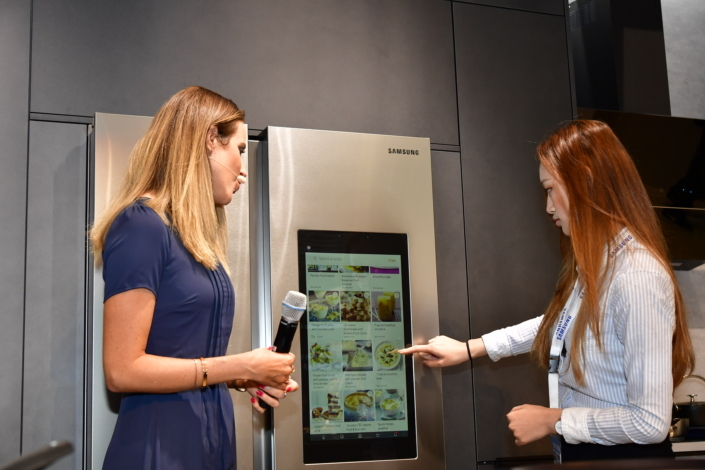 “We are focused on bringing kitchens to life with smart technology that simplifies everything and creates new lifestyle opportunities,” affirms BK Kang, Executive Vice President of Digital Appliance Business at Samsung.